The bitemark evidence in the Kunco case consisted of a photograph showing a bitemark on the shoulder of the victim. 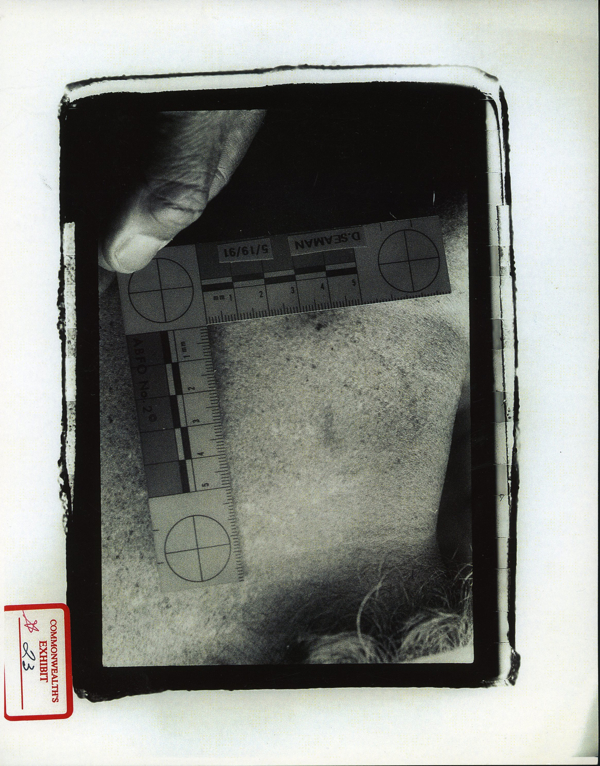 The bitemark evidence became case critical when the 40 pieces of physical forensic evidence recovered at the scene, which included hair, blood and fiber did not link to the suspect John Kunco. The authorities then consulted a board certified ABFO forensic dentist five months after the crime. 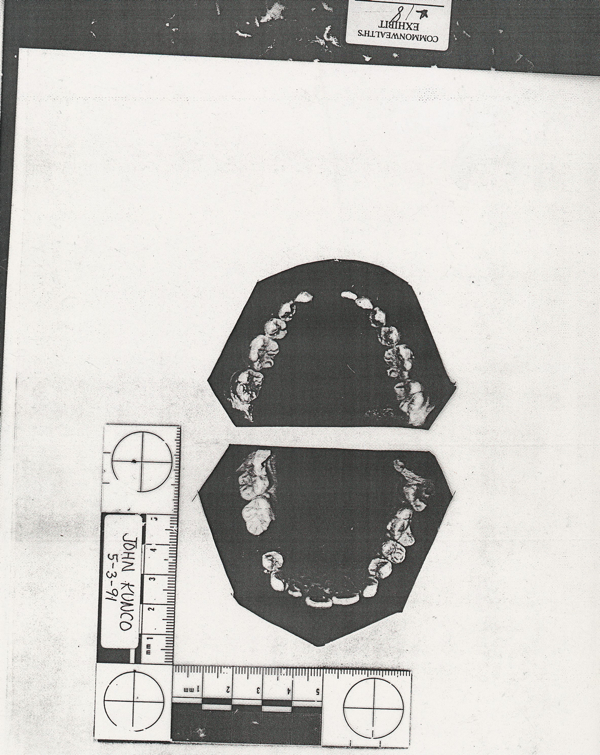 The consulting forensic dentist explained that a scale in the photograph is necessary for the bitemark comparison process. The forensic dentist recalled hearing about a technique that Dr. Michael West developed using UV photography to penetrate the skin in order to capture bruising that still exists below the skin. He believed that he might be able to “see” the old bitemark now not visible through the use of UV photography. The forensic dentist consulted a colleague and photographed the area on the shoulder with UV light. It is from this photograph 5 months after the bite to the shoulder that the intricate details of the biter’s teeth are described through “skin reading”. Click on red text to open new window with files. 3)	Four 4 X 6 photographs. Overlay showing the "uniqueness of individual characteristics and the class characteristics"
I could say that within a reasonable dental certainty, that the bite on the left back shoulder area of Donna Seaman was in fact inflicted by the teeth of John Kunco. I felt comfortable about this decision because there were no inconsistencies that I could come up with at all and everything fit perfectly. Now, all teeth in a bite do not always follow exactly the same size relationships, because remember, we’re biting into an elastic surface. It’s the pattern that we’re looking at. The size relationships, the shape of the teeth … the fractured portions of a tooth, the worn areas, all of these taken together create a fingerprint picture of the individual. Dental identification next to fingerprints is the most accurate form of identification of an individual. I then did an acetate overlay in which I traced some of the outlines of these teeth onto the acetate (exhibit 21). Tooth number 8 tapers upward, there’s a difference in the plane of the surface. Thus there wasn’t any mark visible because it appeared that the head was tilted to the left angle making the bite only a partial bite involving basically the left side of the mouth, upper and lower. First of all, the plane of the teeth, you can see how this tooth is lower than the others, and any bite would then leave off that particular area. Especially if the head were tilted in this way. Exhibit 22 – I prepared this overlay to investigate the pattern of the mark. In other words, to see what we could isolate in the way of teeth and uniqueness of individual characteristics and the class characteristics. I randomly selected approximately 30 sets of models and compared them to the same imprints to see if there were any consistencies that could come up in other individuals easily, although we can duplicate some curvatures of the arch, we could not duplicate all of the individual characteristics. I felt secure in seeing everything matched perfectly as a group and individually; all the features were consistent. Kunco had a relatively unique set of teeth. Remarkable consistency between Kunco’s bite pattern and the bite mark on the victims shoulder. 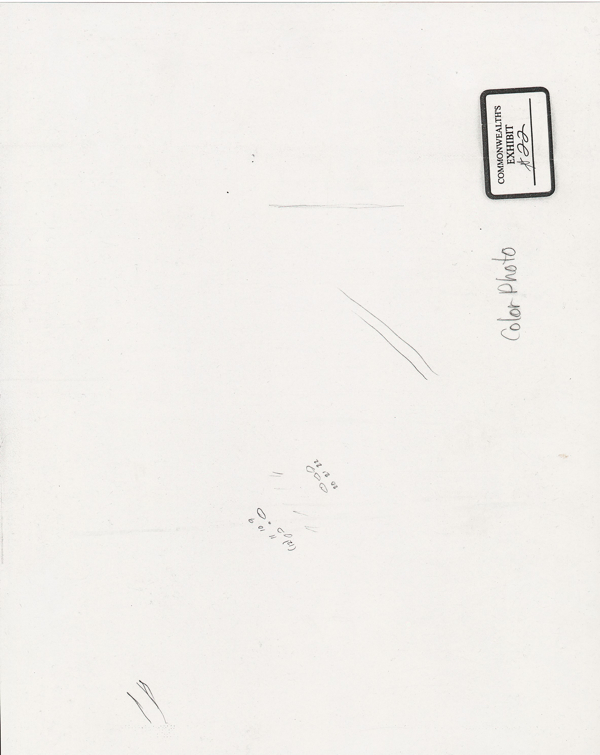 The teeth of the defendant, John Kunco, made the bite mark. Not only is it consistent, but also it is a remarkable consistency. There were some inconsistencies in the tracing, which are explained by the dynamics of the bite. I did not include in the report, an explanation how I did my analysis… its not typically placed in a report.